When it comes to accessories, I'm just as nuts as +Tom Gray and our good friends at TYLT definitely are aware! This is the TYLT RIBBN 4.8A car charger, which features a flat ribbon style cable with an extra USB port on the charger side. Everyone and everyone that has a car knows that we can plug a crap load of fun accessories into our cigarette lighters and this is no exception! I enjoy the tangle free cable that the RIBBN provides, couple that with the ability to connect 2 devices at the same time and you've got a winner. Depending on the number of people traveling with you, this can be the solution for you. However, I would of appreciated 2 cables instead of a cable and a USB socket. 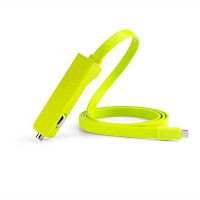 Granted the added USB port does provide multiple other usage, such has, connecting your friends iPhone device or simply wanting to charge a portable battery charger. In the future, I'm hoping to see more out of TYLT. I was thinking something that would provide the 2 cables + an additional 2 USB port. Definitely stay engaged and tuned into Android Coliseum, I will have this up for a giveaway in the next few weeks.